Foreclosure is the process by which the mortgage lender repossesses a property, usually due to a default in payment of a promissory note by the borrower. The lender can then sell the property and keep the proceeds to payoff the mortgage and any fees incurred. Usually language in the mortgage documents dictate at what specified time the lender may begin with foreclosure proceedings. Of course all parties are notified and the proper documents filed at the Barnstable Registry of Deeds. In some cases, when terms have been broken, the mortgage holder may “accelerate” the loan, requesting the entire balance to be paid immediately. In Massachusetts, lenders may foreclose on deeds of trusts or mortgages in default using either an entry by possession or non-judicial foreclosure process. The lender may also use a judicial foreclosure process, but the latter seems to be a more popular route. The process usually takes about 90 days, but in this economy we are seeing much longer time periods to complete the process. There is no right of redemption after the foreclosure process is completed in the State of Massachusetts. After the borrower defaults on the mortgage, the lender may recover possession of the property by: 1) obtaining a court order; 2) entering the property peaceably; and 3) by proper consent of the buyer. If the lender maintains possession peaceably for three years from the date of possession, the borrower loses all rights of redemption. The non-judicial process of foreclosure is used when a power of sale clause exists in a mortgage or deed of trust. A “power of sale” clause is the clause in a deed of trust or mortgage, in which the borrower pre-authorizes the sale of property to pay off the balance on a loan in the event of their default. In deeds of trust or mortgages where a power of sale exists, the power given to the lender to sell the property may be executed by the lender or their representative, typically referred to as the trustee. 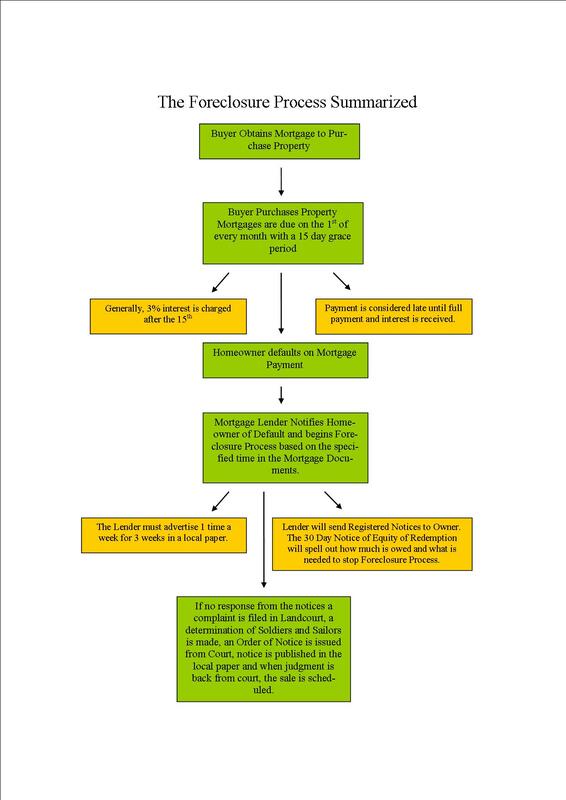 Regulations for this type of foreclosure process are outlined below in the “Power of Sale Foreclosure Guidelines”. A notice of sale must be recorded in the county where the property is located. The notice must also: 1) be sent, by registered mail, to the borrower at his last known address at least fourteen (14) days prior to the foreclosure sale; 2) published once a week for three (3) weeks, with the first publication being at least twenty one (21) days before the sale, in a newspaper of general circulation within the county where the property is located. Said notice must contain the place, time and date of the foreclosure hearing, the date the mortgage was recorded, the borrower’s name, the amount of the default and the terms of the sale. In recent years foreclosures have been much more common on Cape Cod. In certain price ranges, 50% of properties we are showing to buyers are foreclosures. This type of property can offer very good value compared to other homes. But the problem with many foreclosures is that because the owners know the property is going to be repossessed, they remove appliances, light fixtures, kitchen cupboards, faucets, and anything else that might be of value. Usually the work that is required ranges from medium to high.